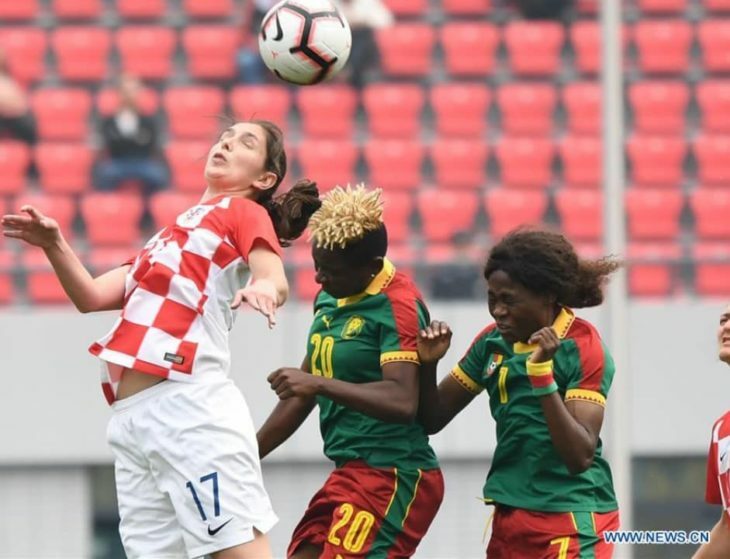 To prepare female national teams for the World Cup to be hosted by France in June, China is hosting a four-team international tournament, which has seen the ladies of Coach Alain Djeumfa qualify to face China. The host nation laminated Russia, to book a place in the final while the Lionesses defeated Croatia. It was Tactician Djeumfa’s first game as Head Coach of the Lionesses. In the selection, he positioned Annette Ngo Ndom as goalkeeper, Christine Manie, Aurelle Awona, Yvonne Leuko, Falonne Meffometou as defenders, Grace Ngock Yango, Therese Abena, Genevieve Ngo Mbeleck and at the attacking compartment, Gabrielle Aboudi, Nchout Ajara, Michelle Ngono Mani. Magdalene Ngono Manie, Lionesses’ all-time goal scorer kept doing what she has always been doing, as in the 33rd minute of the game, her goal gave the Lionesses a head start. The girls kept the score till the first half came to an end. Unfortunately, a 63rd minute blunder by Lionesses shot stopper Annette Ngo Ndom permitted the Croatians to level. 6 minutes to full time, Gabrielle Aboudi Ongene served Michelle Akaba with a beautiful pass as she pushed it into the net of Croatia, offering victory to Cameroon. Coach Alain Djeumfa and his girls have more to do in preparation for the World Cup in France. The Lionesses will face the host nation on Sunday, April 7, 2019, to see who will carry home the trophy.